Things in this world are often not as they seem because there are "unseen" forces, that have gripped and gained control of mass media. Often we recognize these forces in the mainstream media's daily news cycle, controlling the narrative that they want us to believe. But those same Illuminati forces(and here I use this term in the historical context of an "enlightened secret society") are "hidden in plain sight" throughout most of mass media, from TV commercials, to music, to children's books, cartoons and popular movies and they convey their message using the power of music and visual stimulation to condition society in a certain way of thinking, this is commonly known as thought control. - W.E. Labyrinth is a quintessential 80s movie that contains everything we love from the 80s: 80s synth music, 80s CGI effects and a 80s David Bowie in the same 80s hairdo that your aunt Susan had in the 80s. What’s not to love? The movie has, in fact, become a “cult classic” and is still a children’s favorite. But like many of these delightfully twisted fantasy movies, there is more to Labyrinth than meets the eye. 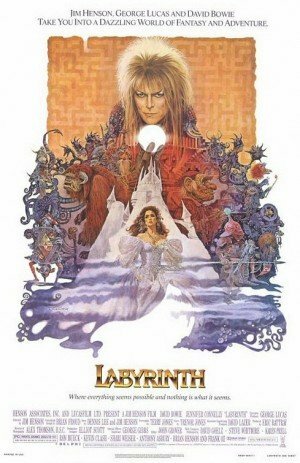 By understanding the occult symbolism and references in Labyrinth, the movie becomes a big allegory for mind control, where each scene refers to a particular aspect of the process. What appears to be a young girl’s quest through a Labyrinth to find her baby brother becomes a metaphor for the internal world of a mind control victim that is being programmed by a handler. The obstacles that Sarah, the hero of the story, must go through relate to real life ordeals inflicted to mind control slaves to incite dissociation (if you have no idea what I’m talking about, read the article entitled Origins and Techniques of Monarch Mind Control). Mind games, torture, drugs and sexual abuse are all referred to in veiled symbolism during the movie, giving to “those in the know” an entirely different story than what is shown at face value. Labyrinth is therefore constructed like most esoteric works in History: it uses symbolism to conceal from the masses while revealing to the initiates. Since Labyrinth is a blueprint for mind control, it is only fitting that the star of the show is an artist who has served as a blueprint to modern pop stars: David Bowie. Throughout his long and eclectic career, Bowie has touched on many occult and ritualistic themes that are today rehashed by industry-made pop stars. And, for some reason, many of those who touch upon these occult themes also integrate mind control into their works. Maybe it is due to the fact that mind control heavily relies on black magic rituals and Kabbalistic teachings. So, before we look at the symbolism of the movie, let’s take a brief look at some of the symbolism used by David Bowie. 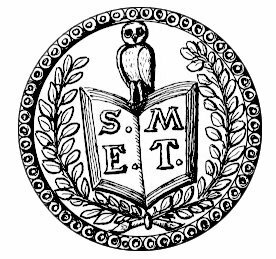 Many articles on this site mention modern pop stars and the occult symbolism embedded in their works. It was only a matter of time before David Bowie was mentioned as he is apparently a major source of inspiration for many of them. David Bowie is indeed the prototype of the pop-star/occult icon whose works incorporated concepts originating from Secret Societies. 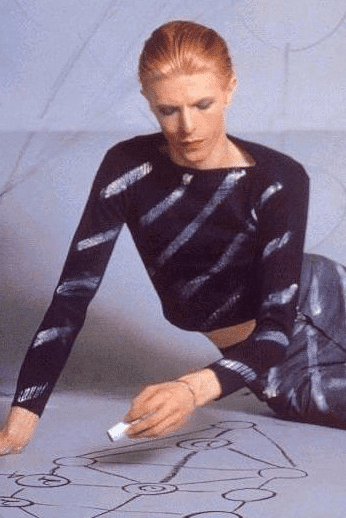 From strange alter-egos, to the occult concept of androgyny, and of course including references to Aleister Crowley and his Thelema, Bowie did decades ago what pop stars are doing now. 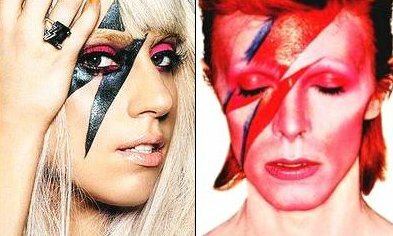 Bowie's alter-ego named Ziggy Stardust was a representation of the "illuminated man" who has reached the highest level of initiation: androgyny (as represented by Baphomet). 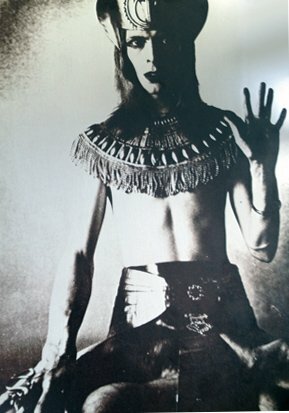 Bowie dressed in Egyptian garbs (like Crowley used to do) and displaying the hand sign of "As Above So Below", also known as the sign of Baphomet. The plot of the movie is very reminiscent of the Wizard of Oz and Alice in Wonderland, two stories that are incidentally known to be used in mind control programming. A young girl, bored and distraught with her normal life, finds herself in a fantasy land, where everything can happen. In order to go back home, she embarks on a dangerous quest to reach a great castle (not unlike the Emerald city of the Wizard of Oz). Along the way, the assertive girl uses her wits, courage and strength to go past the obstacles in a world where no rules are established. Among Sarah's stuff we find a toy version of the obelisk-studded labyrinth she is about to enter and the books of Wizard of Oz and Alice in Wonderland. Both of these fairy tales are used to encourage victims to dissociate from reality. Labyrinth is no different and is probably used in actual mind control programming. Escher's "Relativity" (the image with the stairs going in all directions) right above Sarah's bed. Jareth offering Sarah "gifts" represented by the crystal ball. Sarah must traverse a gigantic Labyrinth in order to reach the castle, which represents her walled-off and compartmentalized core persona. The entire labyrinth is Sarah's inner-world and Jareth is the undisputed master of everything that happens in it. He can also change everything at will. Obelisks are found all across the Labyrinth, a phallic symbol reminding of the sexual control the handlers have over their slaves. Jareth's throne features horns - like many other of things in the Labyrinth - reminding the viewers about the underlying Satanic nature of the process of mind control. The Fire Gang trying to remove Sarah's head from her body, representing the MK slave's dissociation from reality. The Pool of Eternal Stench is basically a big gassy pond full of feces. It keeps emitting flatulence and belches and is therefore very "bodily" place. Sarah sees doll in princess clothes surrounded by bars - a classic way to portray dissociative mind control slaves. To escape the ball, Sarah must shatter a mirror - a symbolic image representing the fracture of her personality. Escher's paintings perfectly represent the nonsensical and utterly disorienting internal world of Monarch slaves. Jareth asks Sarah to sell her soul in exchange of her "dreams". 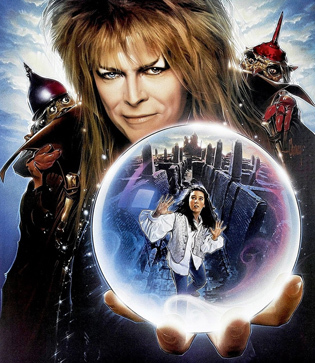 While most viewers interpret the story of Labyrinth as a tale about “the importance of imagination” or something of the sorts, the symbolism of the movie gives it a deeper meaning. Once the imagery and the triggers relating to mind control are understood, the movie becomes a vivid description of the internal world of a Monarch slave during programming. Totally at the mercy of her handler and the twisted world he created in her mind, the slave attempts to return to reality, where things make sense. The task is difficult as the handler controls time (hence the 13-hour clock that keeps popping up during the movie) and space (secret passages in the Labyrinth). During the quest, the slave meets friends who appear to be helping her, but who are, in actuality, leading her to exactly where her handler wants her to be. In fact, Sarah’s entire “quest for liberation” is actually her being manipulated towards the acceptance of her programming. By going through the Labyrinth, Sarah went through all of the trauma necessary to program her. What appears to be the defeat of Jareth is actually a victory as he successfully programmed Sarah’s internal world. It can be used, in her words “every now and again in her life”.